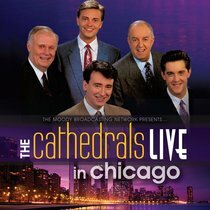 :70 minutes of music, banter and jokes.The Cathedrals were the premier quartet of the last century but until now this particular volume featuring their classic line up has remained in a vault! Now is the time, however, for it to be released. Recorded live at the historic Moody Church in downtown Chicago this was originally recorded as part of the 'Friday night swing' heard on the Moody broadcast network. Includes 70 minutes of music, banter and jokes (with George Younce & Glen Payne) which fans expected and loved at concerts.